The eclipse, which occurs when the Moon passes between the Earth and the Sun but is too close to the Earth to completely cover the Sun, was seen in full across northern Australia, while Sydney saw a partial eclipse. "It was perfect," said Geoff Sims, who photographed the event from a remote spot in Western Australia. "It was my first time I had seen an annular eclipse. I thought it was spectacular. I was actually amazed at how beautiful it was," he told AFP. "It (the Sun) came up in a complete golden ring. Just phenomenal." From his position about 150 kilometres (93 miles) south of the town of Newman, in Western Australia's Pilbara region, Sims described the moment he saw the Moon travel in front of the Sun, as if it was dancing. "It is dancing because the Moon pivots around the edge of the Sun," he said. In November, sky-gazers in Australia witnessed one of nature's greatest phenomena—a total solar eclipse, when the Moon completely covers the Sun and a faint halo or 'corona' appears. The rare spectacle, which was viewed live by millions around the world, drew thousands of eclipse tourists to Queensland. While it took place, the early chatter of birds and animals was replaced by an eerie silence as the Moon overtook the Sun, casting a shadow that plunged the land into darkness, sending temperatures dropping. A partial eclipse was visible across much of Australia on Friday, with those at the Sydney Observatory watching the Moon take a "bite" out of the Sun. "What we were able to see was a partial alignment, so at 7:50am this morning the moon slid partially between us and the Sun, kind of like a game of piggy-in-the-middle," said the observatory's Geoffrey Wyatt. "The Moon blocked part of the Sun... and the tiny little bite got bigger and bigger and bigger as the Moon went between us." In Sydney, at its maximum the Moon covered some 39 percent of the Sun, but those in the north of the country saw it obscure much more, leaving the Moon surrounded by the thin band of bright sunlight. The weather was clear for the partial eclipse, which could only be viewed safely through telescopes and binoculars fitted with solar filters. "All eclipse chasers appreciate that it's always a lottery wherever you go," Wyatt said in regards to the weather, adding that their rarity was a drawcard. 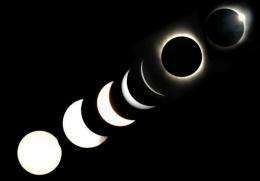 "Partial solar eclipses, they are not common," he told AFP. "The next total solar eclipse that we get to see in Sydney is in July 2028, so that's a long way off."